Lawndale's The Big Show is always difficult to write about. It is, inevitably, a visual cacophony. There are 121 artworks in the show by 73 artists. It is impossible for a show like this to coalesce into unified whole. (That's always one of the complaints about the Whitney Biennial.) The Big Show is always diffuse--the only thing one can say from year to year is that its diffusion takes a particular form (even if that form is complete randomness). This year, it's not random. The show is spinning on an axis and throwing off bits that are far from the axis, but the axis itself is pretty identifiable. The Big Show 2011 pays a lot of attention to large, colorful painting. So how could this happen given the diversity of work submitted? There is a selection of art to choose from (self-selected by the participating artists) and then a curatorial selection from this group. The curator can pick a certain direction, but she is limited by what pieces have been submitted. Given some of the shows curator Larissa Harris has curated at Queens, I don't see a predilection for paintings or bright colors, although she does seem to like "big." So one has to conclude that this year, Houston's paint-slingers submitted a lot of work. John Earles has two large colorful paintings in the show, including the 12-feet-wide Everything We Know Traced in Lines of Lipstick and Fiber Optics. 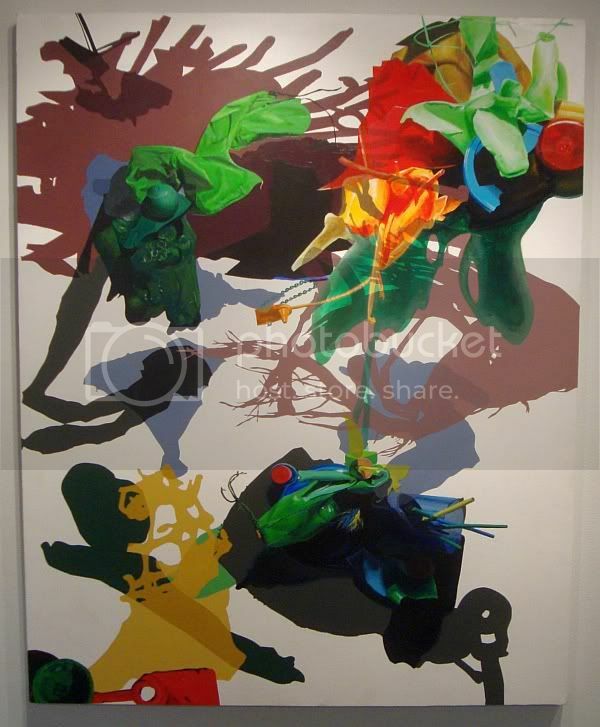 That work has a bit of a James Rosenquist vibe to it. And in general, the work is shiny and plastic. I don't mean that in a bad way. 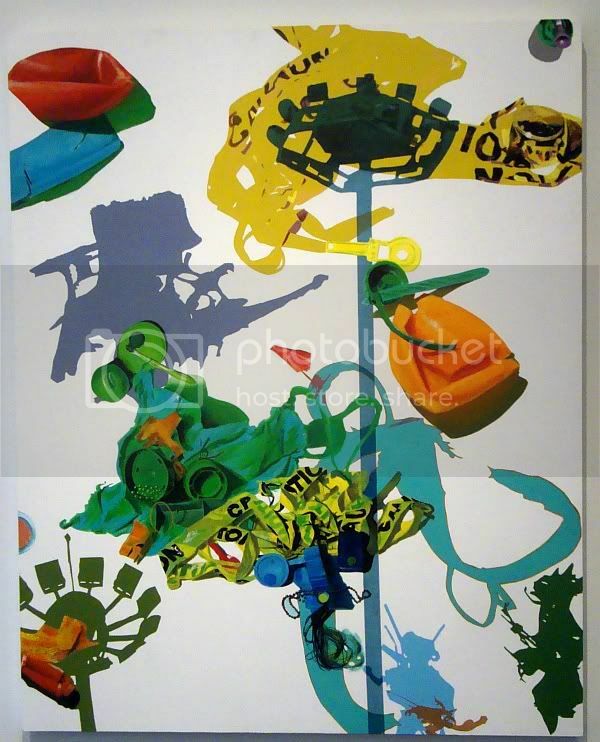 The hard-edge style of painting, the fragmented incomprehensible objects, the flat planes of color; these qualities signify signify "modern" now just as much as they did when James Rosenquist pioneered this approach. Perhaps at some point in the future, this look will start to seem old-fashioned or nostalgic. For me, it hasn't gotten there yet. Lone Star College Kingwood instructor Julon Pinkston employs a similar approach. The difference is that his objects are a little more recognizable (they are trashed pieces of plastic) and he leaves parts of his canvases white. The white ground visually pushes both the objects and the flat-colored shapes forward. There is a real punch to these compositions. 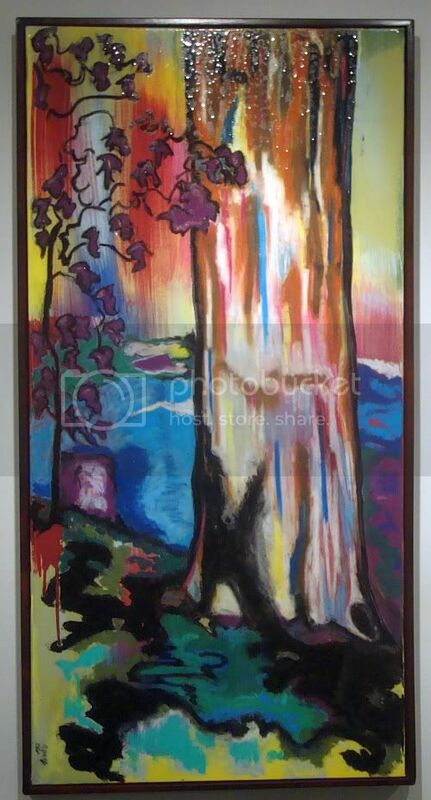 Not every large painting has a bunch of bright colors. 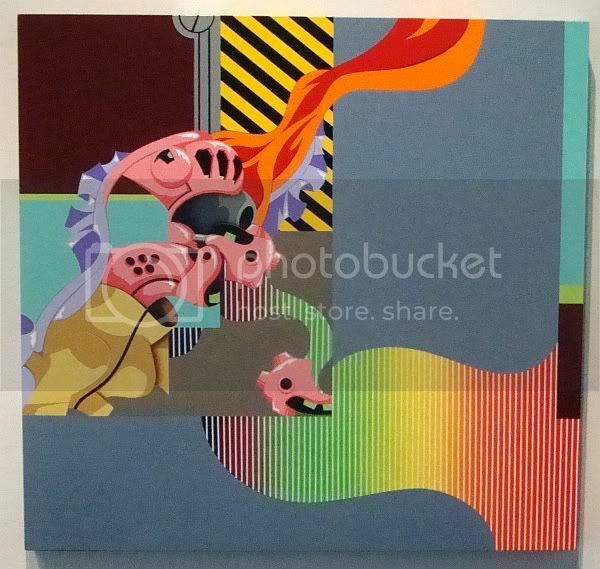 Heather Bause's My Little Pony (Red) has only three colors, but has as much if not more visual intensity as the previous four paintings. This image comes from the Stanford Binet intelligence test for children. It was a test originally developed shortly after the turn of the last century, but still in use (after many revisions) today. Variations of the test have been used to determine whether incoming soldiers were officer material. Blowing up this image from an earlier version of the test reminds one of the cultural and class biases it contained. Other images, with their middle-class domestic scenes, seem even more biased. That said, a test like this has to measure intelligence within the context of the dominant culture because those taking the test will exist within that culture to some degree or another. Blowing up this card turns it into a striking, poster-like image. It's generic quality belies its somewhat scary bureaucratic social engineering origins. 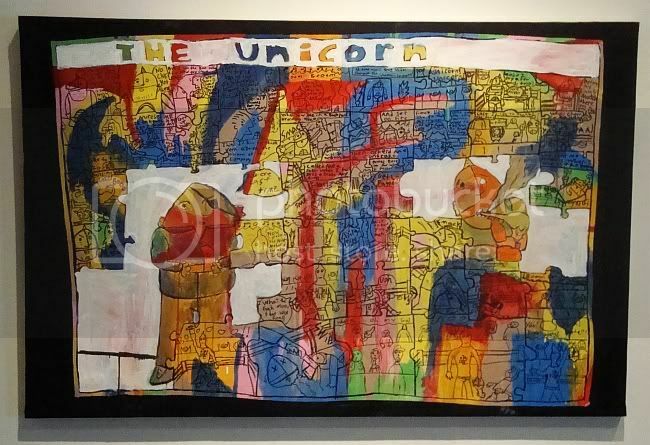 Brian Keith Gardner's The Unicorn takes a more-or-less abstract pattern of colors, then overlays it with black-and-white drawing. The drawing is a comic strip detailing the last bout of a masked wrestler called The Unicorn. The panels of the comic strip are roughly square, and they have little intrusions/extrusions that make them look a bit like jigsaw puzzle pieces. Some of the panels are painted over in white, but even with the blank panels, the story is clear. The Unicorn ends his career fighting a wrestler who is unusually violent--he literally beheads the Unicorn in the ring, to the mindless cheers of the audience. There are various avenues for crossing comics with contemporary art. In this case Gardner has created an actual comic strip and put it into a painting. But the comic he has created is deliberately crude and stupid. He's neither aiming for the soulless slickness of modern super-hero comics nor for the sophisticated expression of a Chris Ware or Lynda Barry. From within the world of comics, this seems closest to Johnny Ryan, who gleefully employs a kind of adolescent expression. Within the art world, a comparison could be made to Paper Rad. Amusingly, Hogan Kimbrell's realistic (if somewhat idealized) wrestlers were displayed right next to Gardner's ultraviolent wrestling fantasy. It seems exactly the opposite of Gardner's painting in all other respects, except that a comics connection can be made here--the outlined figures and flat, poster-like colors resemble comics (at least comics before Photoshop was invented). But mostly it seems like a poster--putting the figures against a white ground does that. One can imagine bold typography added--"London Olympics 2012." U.H. art student Tanya Vaughn's painting is basically a political cartoon. 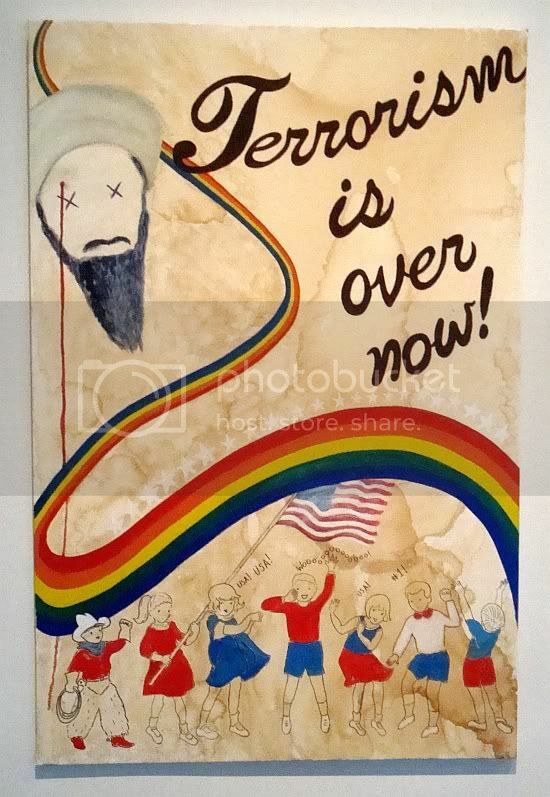 It has an easy irony that simplifies a lot of real world things (as political cartoons tend to do).Vaughn is portraying the celebratory mood following the assassination of Bin Laden as hopelessly naive, as exemplified by the statement "Terrorism is Over Now" and the children celebrating. The fact that the children are depicted in an illustrational style that recalls childrens books from the 1950s reinforces the naivete. 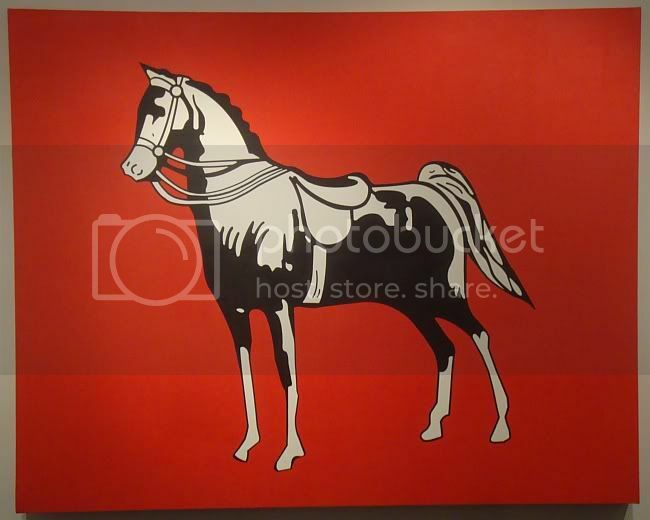 Not all the large, colorful canvases come out of a pop or cartoon esthetic. 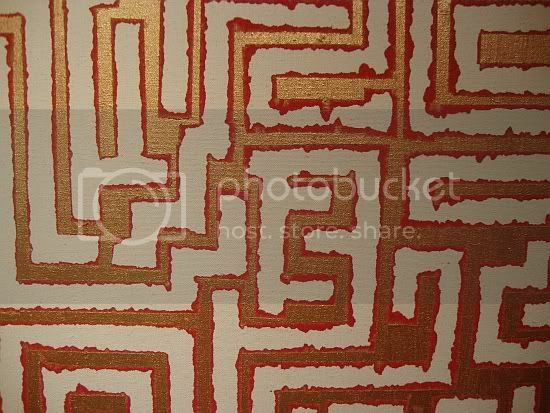 Ya La 'Ford draws inspiration from African fabric designs in her red and gold abstraction La Genesi Del. According to the artist, there is another painting on the back of this one, but Lawndale didn't have a way to hang it to show both sides. I suppose it could have been hung from the ceiling. 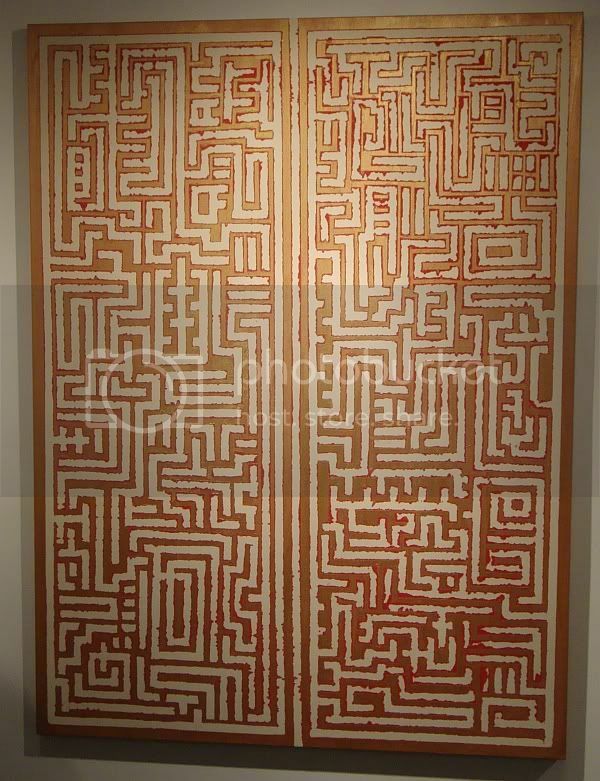 In any case, this side is quite handsome--I like the maze-like pattern and the way the gold floats on top of the red. Likewise, David P. Gray presents us with bursts of color in his two paintings, but in a realistic, highly rendered style that really stands out in this show. Not that there isn't some pop influence. The setting of the restaurant (some kind of nostalgia themed place where old-fashioned menus and a scooter on a plinth are meant to signal "the '50s") speak to Pop, and those water glasses and creamer containers in the foreground remind me a little of Wayne Thiebaud. 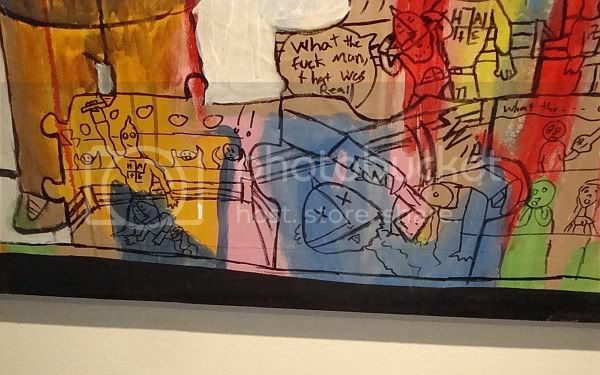 If you look at the artwork he has on his website, it is very different. He does watercolors of Mexican subjects, very much infused with Catholicism, that derive from the period in his childhood when his parents moved the family down to Lake Chapala. But here, he is depicting an all-American scene--guys hanging out, talking in a fake-nostalgia restaurant. What I like is that their conversation is intense--it slices through the weird, unserious setting. I'm pretty sure that the people depicted here are artists. The one of the left looks like Earl Staley (sans eyepatch) and I think the one next to him is H.J. Bott. One could imagine that they are discussing art. It's interesting to imagine that art would be the subject there in what seems like an uncongenial, artless chain restaurant. Of course, I could be misinterpreting it all-together. Still, I like it--this is a complex composition, and Gray really pulls it off. But also the subject--conversation among friends--is rare and wonderful. 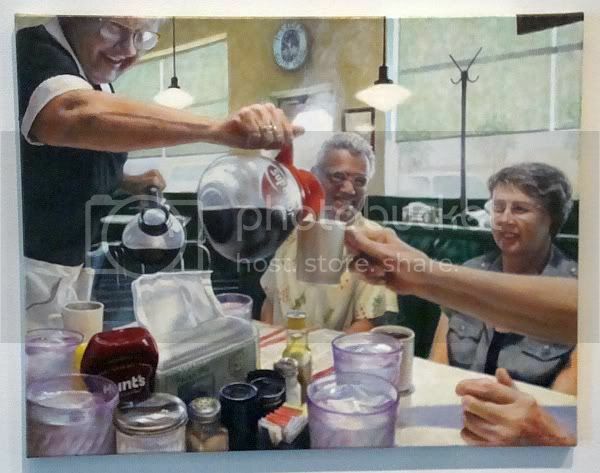 Harvey Takes Decaf has most of the merits of The Question, but it feels more like a snapshot than the former painting, which has (to my eyes) deeper implications about what these are discussing and their relationships to one another. Some of the works in the show were colorful, large and/or paintings, but not all three. Nonetheless, their presence contributed to the overall look of the show. 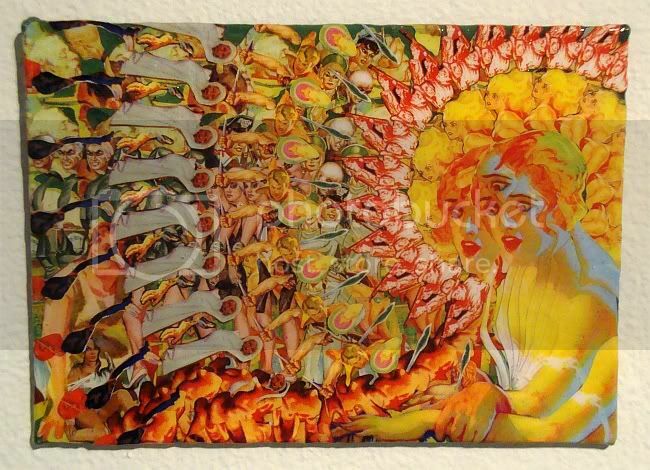 For example, psychedelic collage artist Patrick Turk had a large work in the show, next to two smaller works. But the smaller works almost blew the larger off the wall. What keeps this from being merely a well-executed piece of psychedelic art is double figure on the right--a 1930s beauty with a bob hairstyle, gripping in panic the arm of an unseen person. I would guess it was the cover of a pulp magazine, the the source of her terror was something concrete. In Turk's hands, the terror is the sublime or the infinite as evoked by psychedelic drugs. A fellow contemplator of the psychedelic sublime--this time on a galactic scale--is Bill Fester. As far as I can tell, Fester produces his fractal designs on a computer using a piece of software called UltraFractal. 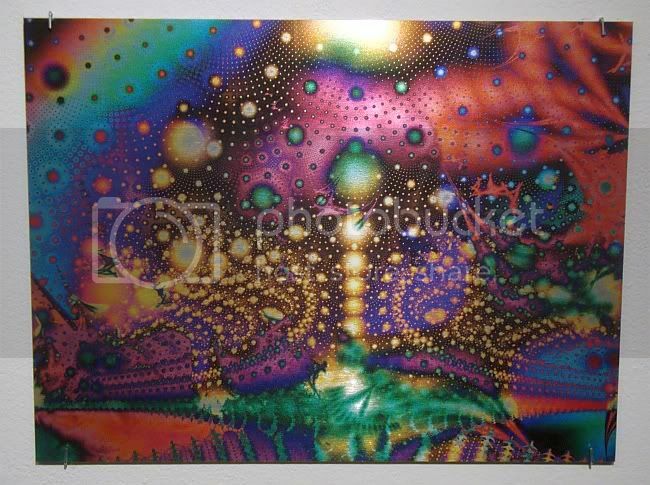 He then somehow prints the images on aluminum. The result is an intensely colored, geometrically complex image. 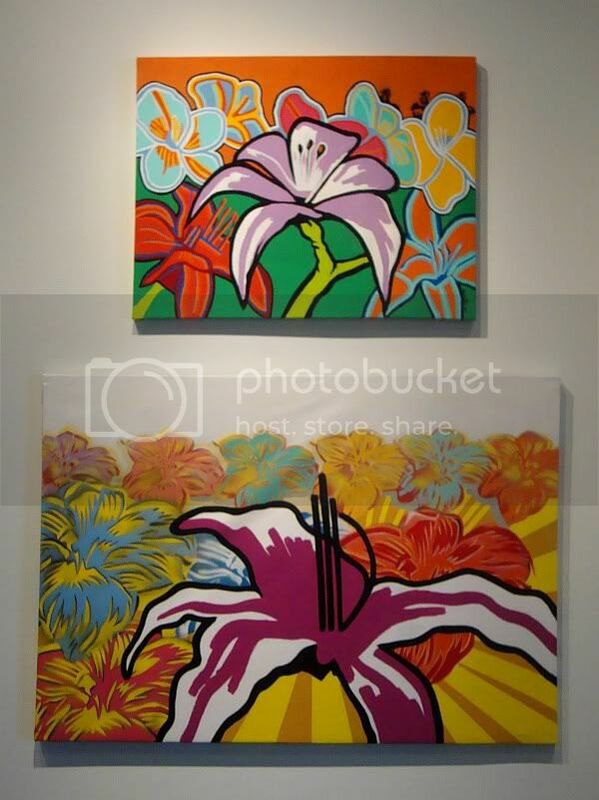 The thing is, this is just a sampling of the large, colorful painted works in the show. Alexine O. Stevens created a brilliantly colored landscape influenced, perhaps, by Chinese painting. But even if the overwhelming impression is colorful! big! painting!, there is a bunch of work that swims in very different directions. I'll discuss some of those pieces--which include my favorite pieces from the exhibit--in the next installment of this review. May I suggest an invisible wall for Ya La'Ford. Sorry 59 diner isn't authentic enough for you, Mr. Arty pants.